Stroll the aisles of your local health food store and our country’s love of “functional beverages”—drinks fortified with vitamins, minerals, and other “healthy” additives—becomes apparent. Products in this $17 billion industry claim to strengthen your immune system, flood your body with antioxidants, and boost energy. It’s faddish, yes. But one of the latest additions, maple water, may also help preserve North American forests and put some welcome cash in the pockets of small farmers. Essentially sap tapped from maple trees that hasn’t been boiled down to make syrup, maple water is growing in popularity, especially in the Eastern half of the U.S. There are now at least seven U.S. and Canadian companies producing it for widely varying price points ranging from $3 to $5 for an 8- to 16-ounce bottle. Compared to leading coconut water brands, maple water contains less sugar, has fewer calories, and travels fewer miles to U.S. markets. While some maple water makers point to its health and hydration benefits and claim that the beverage is all-natural and filled with vitamin B, electrolytes, manganese polyphenols, and antioxidants, others tend to stress its sustainable qualities. In fact, one brand, Vertical Water, is the product of a traditional timber company’s green makeover. As co-founder of Feronia Forests, Valentina Cugnasca had her sights set on a more socially meaningful career. It wasn’t until she pursued a degree in sustainable management, that her idea of “sustainable full forestry” really came together. With the backing of her co-founder and father, Paolo Cugnasca, who also directs a financial risk management firm, Cugnasca set about creating a Benefit or “B” Corporation designed to preserve forests for future generations. In addition to a creating a 900-acre forest adventure park in Lanesborough, Massachusetts called Ramblewild, she began developing a maple water product in 2010. 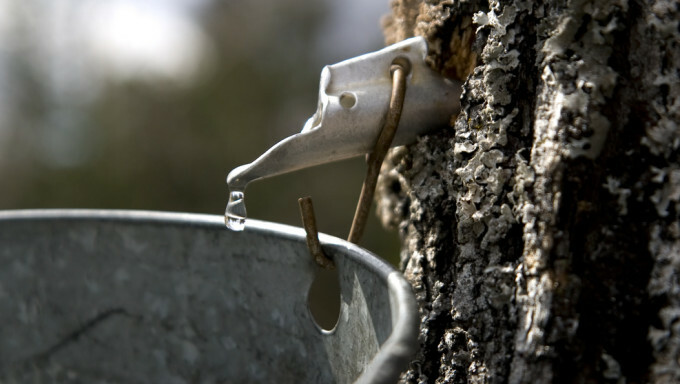 Once convinced of maple water’s sustainability, nutritional qualities, and market appeal, Feronia Forests began connecting with as many suppliers as it could and created the infrastructure necessary to process large amounts of sap. “The more sap suppliers we can involve, the greater the social and environmental impact,” Cugnasca explains. Launched last April, Feronia’s Vertical Water is sold in over 1,300 stores in 40 states. Cugnasca declines to divulge the quantity of maple water so far processed, saying only the company has “exceeded all distribution goals.” All of its 2014 production of maple water was sourced in western New York State from trees outside of Feronia forest in order, Cugnasca explains, “to keep as many trees as possible vertical” (hence the product’s name). In Massachusetts, sports nutritionist Kate Weiler and her business partner Jeff Rose started selling DRINKMaple in May of last year. They stumbled across a Quebec coffee shop selling the product, and were enthralled at the idea of a beverage “straight from nature,” as Weiler describes it. As triathletes, Weiler and Rose were familiar enough with the concept of natural hydration through products like coconut water, but Weiler says, “quite frankly had never really thought about how unsustainable that was.” The Concord, Massachusetts-based pair got to work developing their own brand of maple water. They, too, are now touting the clear, slightly sweet beverage as both a lower-sugar alternative to coconut water (whose makers have recently had to walk back several health claims), and a forest-friendly choice. Drink Maple sold about 160,000 bottles last year mostly consisting of sap from a single New Brunswick farm and Weiler projects significantly higher sales for 2015, gathered from five farms in New Hampshire and Vermont. “The reception and demand have been absolutely phenomenal,” she says. Despite its voguish appearance in yoga studios and paleo cafés, Farrell points to the fact that Native Americans have been drinking maple sap for centuries as a tonic. It is also prized in Korea for its cleansing properties; downing huge quantities during spring maple tapping festivals is a cherished rite in some regions. Although there are increasing numbers of large-scale maple syrup producers, especially in Canada, says Farrell, in the U.S., most syrup comes from small-scale tree owners who make it as a sideline during the spring. “It’s hard, and it’s seasonal, and it doesn’t take a full year,” he explains. Selling maple water adds value to maple trees, Farrell notes, especially if companies pay farmers a fair price for their sap. Not only do small producers save processing cost required to boil 40 gallons of sap to get a gallon of syrup, he adds, everyone benefits from the energy saved to heat it in the notoriously lengthy process. One challenge faced by maple water producers is a lack of pasteurizing and filtering facilities. Vertical Water hopes to form cooperatives of small owners and build the infrastructure that can process their sap quickly in the spring. During the rest of the year, the trees would grow, photosynthesize, and store carbon dioxide—all beneficial to the environment—and provide landowners more money over the long-term than cutting them down in the short-term. When Weiler and Rose started talking to farmers, she recalls, “The hardest thing was finding a place that could bottle, because sap goes bad so quickly; you need the trees-to-bottle supply chain nailed down.” At the time, there were very few ways to bottle without adding preservatives. The nutritionist in Weiler didn’t want to add those ingredients to DRINKMaple. Cornell’s Farrell is also researching the economic benefits of tapping walnut and birch, the two other trees that render highly drinkable forms of sap. In many parts of the world, serious research on less-sweet birch sap eclipses interest in maple sap. For maple farmers already equipped to process sap, cultivating birch, Farrell says, is another way of producing more income from their land.